Some of you may recall a bit of controversy earlier this year over the fact that Temple Run 2 (Free) (and many similar games) didn’t let you play as a female character unless you paid for the privilege. This was brought to the attention of The Washington Post by a pretty awesome 6th grader who argued that it could be a form of gender discrimination, even if the developers didn’t intend it that way. Luckily, Imangi and several other devs took steps toward fixing the situation, but it’s no secret these types of games (and the industry as a whole) still have a ways to go. Well, stepping into the fray with tiny shorts and guns blazing is Lara Croft with her own take on the behind-the-back-runner formula. You’re welcome, women everywhere. So yes, at first glance it seems like this is basically Temple Run (Free) with Lara Croft. In fact, it’s a bit surprising that it took so long for this to happen since runners like this were so popular a few years ago and Tomb Raider seems like such an obvious fit. (I mean, it even has the same initials!) 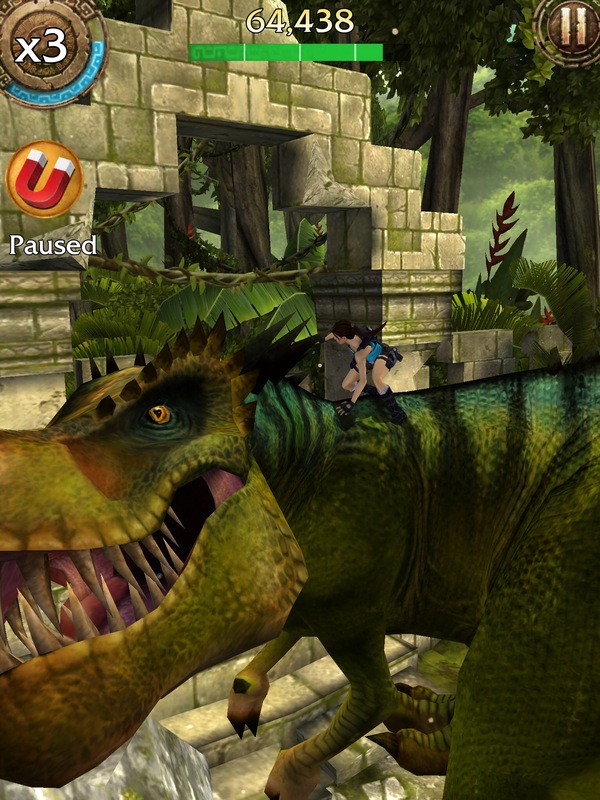 However, once you start playing it becomes clear why it couldn’t be rushed out the door the second Temple Run struck gold: this is a huge, incredibly well-made game. It’s every behind-the-back-runner you’ve ever played, smooshed together and turned up to 11. I rode a T-rex today, guys. A freaking T-rex. In fact, for the first few hours I spent with the game, nearly every single run showed me something new. The variety of obstacles is just nuts. One second you’ll be wall-running over a pit, and the next you’re riding an ATV through the dense jungle foliage. “But wait," I hear you say, “there’s a ton of variety in runners like Spider-Man Unlimited (Free) and Despicable Me: Minion Rush (Free) as well!" Fair enough! But do those games let you fire grenades at lizard people and ride a freaking T-rex? No. No they do not. And all that stuff I just mentioned? That’s only the first area. Another bonus is the game’s free-to-play model, which is surprisingly fair. The first thing I usually do in these games is upgrade the coin stuff to make all the other purchases easier, and I was able to max out Coin Trails (which gives you more valuable currency sooner) pretty quickly. All the other upgrades, weapons, and power-ups you can buy are pretty reasonable as well. Best of all, there’s not a timer in sight. 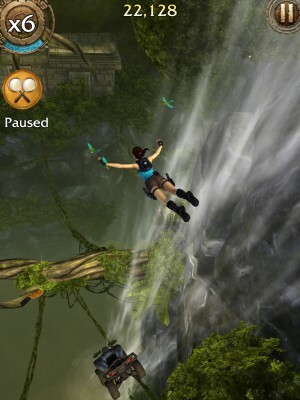 This review may seem overwhelmingly positive so far, but there are definitely some annoyances in Relic Run. I’ve had more than a few occasions where a swipe didn’t register correctly, which is always frustrating in these quick reaction type games. It doesn’t happen too often, but it does happen. Another minor issue is that the game is so twisty and turny and constantly shoving new crap in your face that it can be easy to get slightly disoriented and forget what lane you’re in. Obviously that’s something you get used to, though, and it’s not much of a problem when you’ve spent enough time with the game. Finally, there seems like there are some pretty neat social features that let you screw with your friends–but they only work through Facebook. Of course. Lara Croft has always been a bit of a divisive figure in video games, with some arguing she’s a modern symbol of female empowerment and others saying she’s not much more than polygonal eye candy for teenage boys. The “real answer”, if there is such a thing, is likely somewhere in the middle. 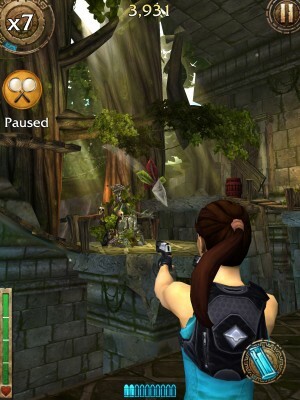 It’s certainly hard to argue against having more female-centric action games on the App Store, though, and Lara Croft: Relic Run is a pretty great one. Sure, it does very little new in the behind-the-back-runner genre, but what it does do is amp up the spectacle and variety to a dizzying degree, proving the runner genre may still have legs yet.